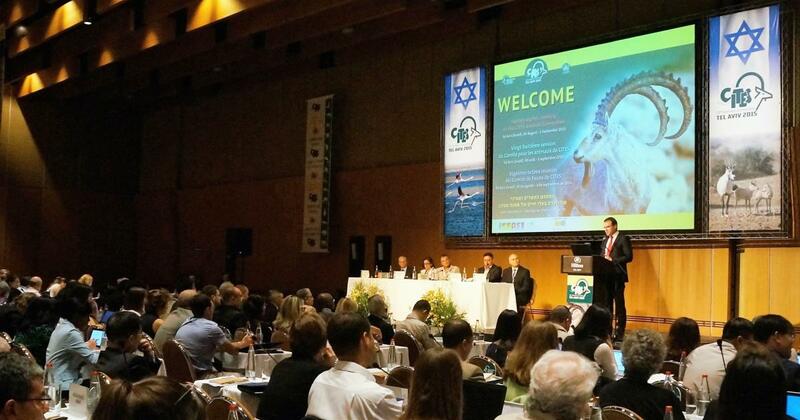 It is a great pleasure to be with you in Tel Aviv today at the 28th meeting of the CITES Animals Committee. This is the first time that a CITES body has met in Israel in the 40+ year history of the Convention and I would like to extend our sincere thanks to the Government and people of Israel for their warm hospitality and impeccable arrangements for the meeting. We are delighted to advise that there are over 200 participants from more than 50 countries registered for this meeting and I would like to acknowledge the wonderful preparatory work done by the Israel Nature and Parks Authority, and to extend our sincere thanks to General Director Goldstein and his staff. I would also like to acknowledge the presence of our Standing Committee Chair, Mr. Øystein Størkersen, who has participated in each of the regular meetings of the Animals Committee since Norway assumed the Chair in 2010. Colleagues, science lies at the very heart of CITES. The science-based recommendations reached at this week’s meeting will provide the Parties to CITES with the best available scientific advice to inform their decisions on conserving and sustainably using wildlife, as we finalize our preparations for the 17th meeting of the Conference of the Parties (CoP17) in Johannesburg, South Africa in just over 12 months’ time, which we are all very much looking forward to. You have a full agenda before you – one that deals with a wide array of species, as well as technical issues and, in some cases, matters that have significant policy implications for CITES Parties. And one species on the agenda that has over recent weeks generated global headlines, is the African lion. The outcomes of the UN Conference on Sustainable Development or Rio+20 in 2012, recognized the important role of CITES as “an international agreement that stands at the intersection between trade, the environment and development”, which reinforced the links between CITES implementation and sustainable development. The wide media coverage on wildlife management and trade over the past weeks and months has highlighted that CITES can often be a focus for a robust debate about issues that are directly, or indirectly, related to conservation – which include sustainable use, animal welfare and animal rights. These related, but possibly conflicting perspectives, generate a lot of interest amongst practitioners and the public at large, as is reflected through the extent of traditional and social media coverage, as well as academic articles, on CITES-related issues. CITES is perhaps the only global forum in which we see experts and advocacy groups from such a wide range of perspectives come together in one place to discuss, and contribute to the making of decisions and recommendations on such issues, which is a great strength of CITES. CITES is both a trade and a conservation convention that uses trade-related measures to achieve its conservation objectives. It is also the first, and possibly remains the only, global legal instrument to directly address animal welfare, albeit in relation to a limited number of issues, and primarily concerning the transport of live specimens in trade. To date, States have considered that most animal welfare issues should be addressed through domestic law rather than international law and there is currently no global treaty governing either animal welfare or animal rights. It is perhaps partly for this reason that CITES often serves as a forum for the expression of a wide range of differing views on international trade in wild animals, including on particular trade transactions, whether all of the actions sought by various actors fall under the current mandate of CITES or not. I raise these matters today to remind us all that while there are many legitimate and passionately held views on wildlife management and trade, we derive our mandate from the Convention text and resolutions and decisions of the Conferences of the Parties and are bound by the rule of law. As such, there are some issues that lie outside of the current remit of this Committee and the Convention. However, while there are limits to the current CITES mandate, which has evolved over time, the wider debate is out there. Social media, with all of its strengths and weaknesses, drives much of it and perhaps we should look at how we can further engage in, and help inform, this wider debate. For example, some of the science-related issues I observe as I speak to people and follow the wider debate is how can one reconcile the protection of an individual animal with the conservation of that species? CITES is about conserving the species but are the two irreconcilable? The Convention addresses a few aspects of animal welfare, but most are left to be determined nationally. Is there scope to offer some further guidance to Parties on certain animal welfare issues, such as conditions in which animals are handled prior to, or following, international trade transactions? Or is this best left to the national level, as is currently the case? I also observe conservation and sustainable use, animal welfare and animal rights perspectives becoming intertwined in this debate, and often without a very clear understanding of the conservation impacts of different approaches. It may assist our Parties and the general public to get a clearer sense of these different perspectives, how they relate to achieving the conservation objectives of CITES, and how they might be further discussed in the context of CITES – as well as to recognize that some areas fall outside of the legal scope of CITES and may need to be addressed elsewhere. Let me conclude by congratulating Mr. Tom De Meulenaer on his well-deserved appointment as Chief of the Scientific Services Team and thanking Mr. David Morgan for the splendid job he did as Chief prior to moving onto his new role in the Secretariat. Let me also introduce you to three new faces in the Secretariat: Ms. Nadia Berny, our Meetings & Conference Assistant, Mr. Daniel Kachelriess, our Marine Species Officer – and first ever CITES Junior Professional Officer, and Mr. Johannes Stahl, our acting Scientific Support Officer, Fauna. Thank you again to our generous host, the Government and people of Israel, to all of you for your participation and to our hard working Secretariat team. I wish you a highly successful meeting here in Tel Aviv.